Sedona's Art Scene – Outstanding. Diverse. Exceptional! The Sedona has a thriving arts scene, it has grown into what the New York Times refers to as “A new west enclave of galleries.” Fascinating landscapes and breathtaking beauty provide inspiration and revelation for artists of all mediums. Sedona is home to an array of galleries and studios, events and festivals for the collector, want-to-be artist, or the souvenir shopper. The Sedona Gallery Association organizes the First Fridays event. On the first Friday of every month from 5:00 – 8:00 pm members of the association offer an exceptional showcase highlighting artists, special exhibits, and events. These remarkable art receptions give locals and visitors the opportunity to enjoy light refreshments while beginning their weekends with an exploration of Sedona’s exciting art scene. The Sedona Trolley provides free transportation to wander from gallery to gallery. There are numerous classes available to locals and visitors to get a hands-on experience. The Melting Point and Sedona Arts Center are just two studios that will provide workshops and classes to suit guests of all levels – from beginners to advanced. Another exciting event for artists and the public is the Sedona Visual Artists Coalition Open Studios Tour. Get up close and personal with 40 +/- professional artists in the area when they open their private studios to the public to view. 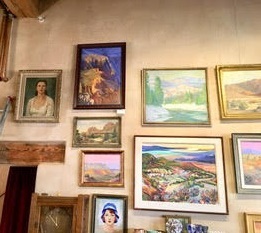 The annual tour has become known as a golden opportunity for art lovers to visit with professional artists in authentic working environments, as well as purchase art while enjoying the lush landscape of Sedona and the Verde Valley. It also offers a venue for local artists to shine by engaging visitors and fostering a community that values the arts. This year it is April 27 – 29 and is a free event! Come to Sedona and experience the rich art culture here with a tour of the various and diverse art galleries of Sedona. Owner of El Portal Sedona Hotel, Steve Segner, worked with the Sedona Chamber of Commerce to create the Sedona Gallery Walk, so tourists and locals alike can see and appreciate why Sedona is a world-class art destination. The art collection at the hotel itself is eclectic and exceptional!